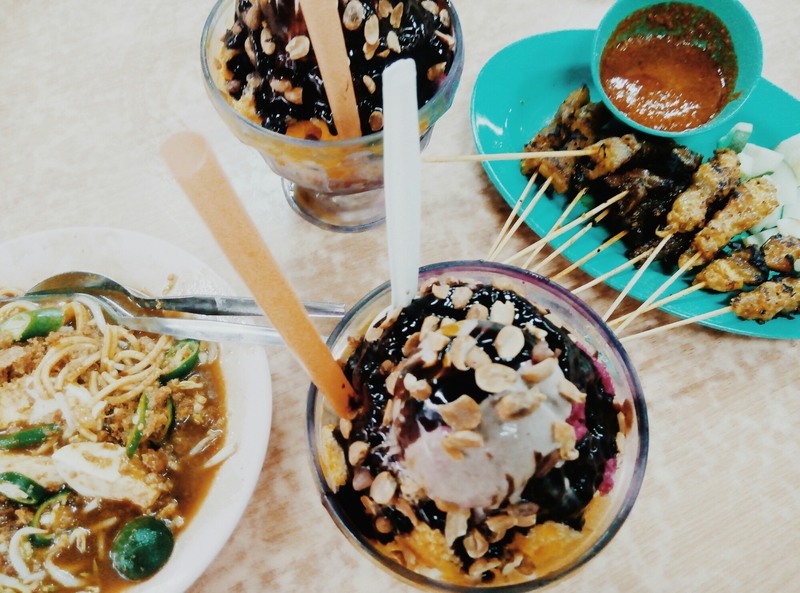 These are the best ais kacang (ABC or Patbingsu), mee rebus and satay I have ever tried. Seriously, these are the best. For Malaysian readers, fly to JB now, I said now and try these. For non-Malaysian, fly too or use cruise or ship or train, come to JB, Kg Melayu and look for these and eat it. I do not fancy ABC that much and I think some of my friends realize this. I prefer Cendol (will update soon) instead of ABC. However this ABC changes everything, I wish someone can tell if I can get this around Kuala Lumpur. When I ordered ABC, I asked the waiter, “Is your ABC only has one type?” Waiter then asked me to be patient since she was busy took my father’s. The she said, “Yes, we only have one type”. I said, “ohh I thought you have regular and special because that table (next to my table) looks different.” We ordered two for 4 people (we just had lunch). When it arrived, I simply took out my phone, “Mom wait! I have to keep the picture.” Don’t worry, mom did it too. It tasted, YaAllah, Subhanallah, super delicious! Then I tasted my mom’s mee rebus (noodle) and again I love it. I do not fancy mee rebus too, I can eat but I always had my mom’s instead of I order it for myself. It had this crunchy thingy that was delicious. Mom said it was fried shrimp but tiny and it looked like it was crushed. You have to try this mee rebus. No regret there. I gained some weight that day but what is done, is done. Food have to be tasted. Don’t get me start with satay. For all food lover, satay is known as Malaysian or Indonesian most popular dish. Isn’t? But this satay, sorry to say the king of all famous satay you have heard or tried. Satay around KL, the famous one, nahhhhhh, cannot challenge this Kg Melayu, JB’s satay. The chicken meat was so tender and sweet and tasty. The meat was so soft and perfectly cooked. The sauce, the sauce, you can drink it as it was delicious. Now, don’t get confuse when you arrived Kg Melayu JB, you will see two ABC sign but go for the most crowded one. The place where you have to wait to be seated. If you stand if front of mosque entrance, look and go to your right. The place is not fancy with chandelier, hundred ringgit of decoration and air conditioner but good food is good food. What are you waiting for, come and eat. By the way, I just wrote this post as my experience, I don’t have any share at all. Just spreading good food for happy tummy.